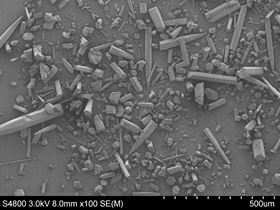 These are crystals of one of the materials discovered using the new computational method, as seen by an electron microscope. This material has a very high methane deliverable capacity, making it promising for use in natural-gas-powered vehicles. Image: University of Southampton. Scientists at the University of Southampton and the University of Liverpool, both in the UK, have developed a new computational method with the potential for revolutionizing the way we search for, design and produce new materials. The researchers used sophisticated computer modelling to map how molecules assemble and crystallize to form new materials – each molecule leading to a myriad of possible structures, each with different properties and possible applications. This new approach, reported in a paper in Nature, could accelerate the discovery of materials for key applications in energy, pollution control, pharmaceuticals and a host of other fields. "When an engineer builds a dam or an airplane, the structure is first designed using computers. This is extremely difficult at the size scale of molecules or atoms, which often assemble in non-intuitive ways," explains Graeme Day, a professor of chemical modelling at the University of Southampton. "It is difficult to design at the atomic scale from scratch and the failure rate in new materials discovery is high. As chemists and physicists trying to discover new materials, we often feel like explorers without reliable maps." "Each molecule has an associated energy surface, which you can think of as being like the map of a desert island,” continues Andrew Cooper, director of the Materials Innovation Factory at the University of Liverpool. “Some islands contain treasure in the form of useful new materials, but most don't. There is an almost limitless number of molecules that we could, in principle, make – this new method tells us which islands to search and what to look for." Unlike engineers, chemists are not truly free to make any structure they want: they are limited to discovering structures that correspond to the optimized positions of atoms – known as local minima – on a highly complex energy surface. This surface can only be fully represented in many dimensions, so cannot be easily conceptualized. The UK team has now combined methods that predict how molecules form crystal structures with computer simulations that predict the properties of those structures. This produces relatively simple color-coded maps that can be used by researchers without a computational background to locate the best materials for specific applications. For example, a researcher trying to create a highly porous material to store a particular gas might use the map to identify molecules with the optimum properties. In the simulations highlighted in the paper, the researchers applied this new approach to a series of known and hypothetical molecules. This led to the discovery and synthesis of materials with large methane storage capacities, which has ramifications for natural-gas-powered vehicles. The research also led to the synthesis of the least dense molecular crystal that has ever been created, showing how computational methods can be used to discover materials with unprecedented properties. This story is adapted from material from the University of Southampton, with editorial changes made by Materials Today. The views expressed in this article do not necessarily represent those of Elsevier. Link to original source.